I’m sort of a treasure hunter by trade. 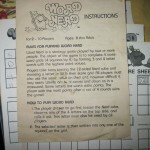 One recent treasure that I discovered was a vintage copy of a Hasbro word game called Word Nerd. Some treasures aren’t worth much money, and Word Nerd falls into this category on the financial end, but I like rare and odd board games, and this fits the bill. For your pleasure and possible playing enjoyment, here are the Word Nerd instructions and a gallery of photos of the find. 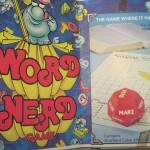 Word Nerd is a strategy game for 2-10 players ages eight through adult. First, choose a player to go first. That player rolls the “Nerd Cube”, aka red die. 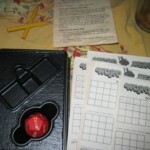 The player then chooses one of the four letters on top of the die and says it to the group. Each player writes the letter into one space on their Word Nerd Grid. The Nerd Cube is passed, and play continues in this manner until all 16 squares on the grid have been filled. When the blank side of the die is rolled, the player may call out any letter. Words can’t be spelled diagonally. Plural forms (“s” at the end) cant be used: i.e. no “Dogs”. Some variations are acceptable if agreed upon prior to beginning the game. They include allowing more than one word per line, using proper nouns, foreign words, and abbreviations, and reading words right to left and bottom to top. The player with the highest score wins. There is no indication of what to do in the event of a tie, so should it happen, choose a tie-breaker rule that can be agreed upon by the group.